Thus far in this series about horses we have we have explored some of the interpretations of the fossil record of horses and demonstrated the difficulty of defining the boundaries of species of modern horses. We have observed that evolutionary theory and most modern young earth creationists propose that the domestic horse, the donkey and the zebra all shared a common ancestor in the past albeit the former millions of years ago and the latter just 4500 years ago. But what does the Bible itself have to say about the origins of horse diversity? There are many—hundreds in fact—references to horses in the Bible but what Biblical evidence is there of rapid evolution of horses from a common ancestor within the time-frame that 24-hour day Ken Ham and most young-earth creationists believe the Bible demands? Well, none that I or anyone else have found. The Bible contains clear observational evidence that multiple species of horses existed throughout the time-frame that Biblical events took place. This includes the wild donkey that made its home in the wilderness, the domesticated donkey, the mule (a horse x donkey hybrid) and multiple types (pale, white, black) of domestic horses. For example we find as early as Genesis 12 a record of Abram’s travels to Egypt in which he brought donkeys: “And for her sake he dealt well with Abram; and he had sheep, oxen, male donkeys, male servants, female servants, female donkeys, and camels”. (Genesis 12:15, English Standard Version). By young-earth accounting of Biblical chronology this occurred only 400 years after Noah. Near the end of Genesis we find that Pharaoh had many thousands of horses that pulled his chariots. Exodus 9:3 (ESV) shows that donkeys and horses were clearly distinguished from one another at this time: Behold, the hand of the LORD will fall with a very severe plague upon your livestock that are in the field, the horses, the donkeys, the camels, the herds, and the flocks. Canst thou make him afraid as a grasshopper? What do the hundreds of references to these equines in the Bible tell us? If nothing else they tell us that even in the earliest Biblical times these animals looked and behaved just as these animals do today. From the Biblical record alone we can go back to at least 2000 BC and find donkeys and horses. From cave paintings and other archaeological sites we can find definitive evidence of multiple species of modern equine species much further back in time. If there were only two horses on the ark that diversified into all of the modern species (zebras, donkeys, quaaga, onager, kiang, and horses) plus 100 or more extinct species the lack of any physical or eyewitness evidence of these radical changes from one to another is rather stunning. * Are we to believe that all this change happened in a just a few hundred years after the Flood and went unrecorded or left any other physical evidence? There isn’t a plausible genetic scenario known whereby such dramatic divergence could take place in such a short period of time. The Bible gives us no evidence of missing links and transition species that would give so much as a hint of this fast evolutionary scenario that creationists have been promoting. Ironically, creationists have ignored this “Biblical” evidence in constructing their fantastic claims of rapid post-flood evolution of hundreds of species from common ancestors on the ark. What we see here is a case where creationists are chasing their own tails trying to explain biological diversity in hopes to compress thousands of living species into a few species on Noah’s ark to make the ark more feasible. But rather than providing greater clarity, they have done nothing but highlight the bankrupt nature of their theological and scientific assumptions. The Bible provides no accounting of what animals were on the ark aside from a few mentioned by name (dove, raven etc..). Putting fewer animals on the ark may help the ark seem more scientifically feasible but by doing so creationist have put themselves in the position of having to propose radical and untenable evolutionary theories for the origin of tens of thousands of species from only a few individuals. This is not only scientifically ridiculous but doesn’t even fit any of the evidence from the Bible itself. Every animal in the Bible is described in a fashion that makes it apparent that these species were fundamentally the same then as they are today. In summary, the authors of the Bible treat the animals around them as if they are the same ones that God created from the beginning of the world (see my series Consider the Ostrich) not some radically morphed versions of a prototype or “ideal” kind. There is no evidence of super-fast adaptation/evolution in the Bible and neither is there even any extra-biblical evidence of such rapid speciation from which to draw support. *We should also add that we have other evidence that the horses in the Bible were the same species of domesticated horse we have today rather than any of a hundred extinct species. We have DNA extracted from bones from archaeological sites that are very old that demonstrate that they were the same type of horse that we are familiar with today. I was going to suggest looking at the oldest known historical documents that mention horses and their modern form, since this must surely take us back to long before the age attributable to Abraham. However I find that the AiG chronology, at https://answersingenesis.org/bible-timeline/how-does-mans-history-fit-with-the-biblical-timeline/ , claims that Egyptian civilisation could not have started before Babel, which they place a mere three hundred years before Abraham, so it is obvious that they will simply deny the objectively established age of any relevant historical or archaeological evidence. 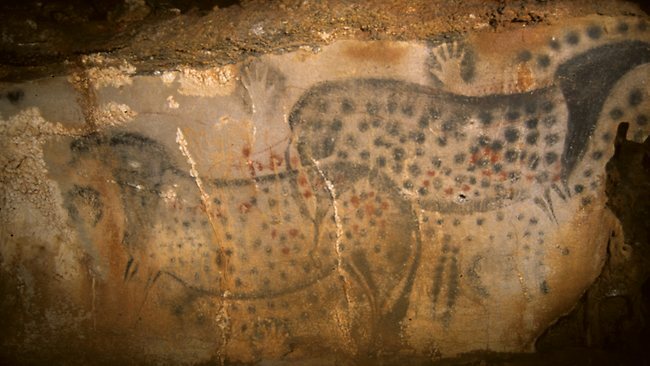 European cave-paintings of horses may be relevant. Seeing as most YEC believe that the Paleolithic archaeological evidence is attributable to the first couple generations after Babel. Leaving them with just a couple centuries wiggle room to get from proto-horse kind to modern horses and then stop. The Pech Merle horse is pretty nifty, as modern genetics suggest that the spotted pattern was a recent mutation. Were the spots on the paintings thus symbolic? No! aDNA revealed spotted patterns were much older than we thought. Connected to your post, this further highlights the impossibility of what’s going on. There’s even more genetic diversity than expected, all of which would have to evolve in this short timeframe. Why should it document the changing horse kind anymore then changing human kind? The differences in humans would be expected to be a example of how much a KIND can change but still be within kind. What differences in humans would those be, Robert? The differences between all humans alive today are very superficial – a matter of skin colour, hair texture, lactose intolerance, epicanthic folds, variations in height and build over a pretty narrow range, etc. Nothing that presents any barrier to interbreeding.The differences between Neolithic Peoples and Neanderthals were a little greater, but still, we now know, not enough to prevent interbreeding, since all people of European ancestry have some Neanderthal genes in them. Are you imagining that Noah and his family were more different from us than Neanderthals were, or half the height of modern humans? Eohippus was much less than half the height of a modern pony, let alone a modern horse or zebra, apart from other major differences. Do you suppose that if they had lived at the same time they would have been able to breed successfully with each other, when even horses and donkeys cant produce fertile offspring together? And why would humans domesticate an eohippus, had they existed as contemporaries? What use would a creature that size be as a beast of burden? Human bodyplans are not superficially different. they are profoundly different based on biological mechanisms. Ours or evolutionists but something. I don’t agree interbreeding is relevant to speciation.speciation has occurred if bodyplans have changed by way of mechanism with genetic results. I think small horses or big is just showing variety due to the place they live. not a evolution. its funny how backward this idea is when you think about it. they just thought small would become big. jUst unmerited guessing. The horse never was on the ark in its present bodyplan I think. It looked different. What is the difference in the body plan of a horse and a zebra? probably all horses were striped before our present horses were domesticated. Even Zebras are divided into species based on a bodyplan/genes difference. They seem to maintain a segregated populations. My point is that all that is needed is a bnodyplan/genes difference in segregated populations for the mechanism to have happened. Reproductive compatibility/or not is irrelevant to the mechanism and so irrelevant to speciation. There are indeed genetic differences between Equus grevyi, Equus quagga burchelli, and Equus zebra. What are the ‘body plan’ differences? It would be the stripe spacings and so the genes for that. Might be other things too. I am just an MD who has been following this discussion, but you, Robert Byers, do understand that stripes and their spacing have nothing to do with body plans right? Dear goodness, you and Peer’s unwillingness to answer all of the extremely relevant and cogent questions asked does not speak well for you. Sorry, I will be quiet now, but the RB/Peer intransigence has gotten to me. CJ, SH, PB, Adam, and CJ (oops, did I say CJ twice? I really like her.) should know I appreciate their efforts. It does make a difference with many people. Strange, Robert, that you hold stripes in such importance in different ‘body plans’ when considering species of Equus, yet you completely disregard them when you claim that the thylacine is identical to the placental wolf. It is just all epigenetics and transposons that does the transformations, not random mutations. We know that random mutations destroy genomes. And selection is nowhere to counteract its destruction. Biology is completely different from what we are taught in schools and Academia. Evolutionary changes have been saltational and extremely rapid. Because it does not require novel information, but only a reorganization of what was created and present in the baranomes. The difference among humans really is superficial. Objectively (and genetically) it is far smaller than the diversity within most living species. The problem is that the human brain is built to mentally amplify tiny differences in features among other humans (particularly in the face). That is why it’s much easier to tell people apart by looks than dogs, yet for dogs it’s the exact opposite. Humans aren’t that diverse, we just subjectively perceive it that way. If you want to understand the rapid speciation processes that were ongoing shortly after the flood, study the cyclids in Lake Victoria. The Lake was dried up about 12 thousand radiometric years BP. Until recently it contained about 500 different species. All niches occupied, from vegetarians to predators to parasites. Part of the lake was closed of by a natural dam around 2 thousand BP. There we also observe novel species. This shows that speciation, but also adaptation, is an inherent created part of the genomes. And it does not require eons. It is instant. And we know how it works. Likewise, all horse-like animals arose in a blink of an eye. Biology is completeky different from what we are taught in schools and Academia. Darwins 19th century (!) gradualism is completely and utterly wrong. My baranome hypothesis explains how biology works. It can only work within a brief time interval, since random accumulation of mutations will lead to demise of information, which is the basis of biology. Is the diversification of Lake Victoria cichlids a secret kept from public education? I think you will find that it is not. Speciation can indeed happen rapidly in certain circumstances, but a few hundred years of speciation cannot account for the diversity of form seen within the various families and orders of mammals today, let alone their past diversity. yes, cichlid fish species compared to cats and dogs from a common ancestor are apples to organges comparisons in terms of the necessary changes that must occur to achieve those amounts of diversification. Peer, how do you then draw a line at physical common ancestry of man and apes is such vast differences can be accommodated so quickly. I would add that creationists have an admirable willingness to accept evidence from molecular biology when it suits them (as in the many cases of convergent evolution from separate founder populations in the African great lakes), while alas ignoring it when it does not. Ever hear of Goldschmidts hopeful monsters? Many of them went extinct almost immediately after the arose sponteously as an act of increased TE activity after the flood. A notion not so much a hopeful monster as a hopeless scapegoat. I get the feeling that you are not interested in understanding how the model of rapid speciation could work. You already “know” everything. I used to be like you, but due to my quest into genetics, I now know that genomes are highly flexible, adaptively respond to the environment and evolutionary changes and speciation are instant, driven by epigenetics and TEs. Of course you are free to ignore the implications of all this new biological knowledge. As said before, if you give me your personal email, I will send you a free electronic copy of my book Darwin Revisited. I know very little about genetics, and will defer comments on that to people here more knowledgeable than I. But I don’t need specific knowledge about mechanisms of rapid speciation to know that the radiation of an entire infraclass of mammals (marsupials) cannot be hand-waved away as being just like the cichlids (note spelling) in a single lake. What I do know is that dismissing the entire radiation of the family Equidae (over a hundred species, vast differences in morphology, spread over all continents except Australia and Antarctica), with the exception of a sole surviving genus of 6 species, as the near-instantaneous appearance and then extinction of a bunch of ‘hopeful monsters’ is not only non-scientific, it is completely absurd. What makes equid species ‘hopeful monsters’ while extant cichlid species are a testament to creation? The fact that they are extinct? Merely a convenient way to gloss over something important that doesn’t fit within your explanatory framework. I note that this is a conclusion you have drawn from current biological investigations: but verification of your notion that evolutionary change and speciation are “instant” still awaits. This merely represents assertions from you, with biological concepts constrained to operate within the time frame of a couple of thousand years because of religious beliefs, and you have demonstrated in this forum that you have little appreciation of the diversity of past and present organisms that you are attempting to shoehorn into the blink of an eye. Peer, so there is nearly instant change but then followed by 4000 years of stasis? What prompts the change and then what prevent future change? And more importantly how did is propensity for having a rapid burst of change get preserved in the individuals preserved on the ark? Did they not change before? Could the environment really not have caused them to change beforehand? I also think that what you need to ultimately grapple with is how God causes these things? Is this a series of miracles or is this all foreknowledge of the Flood and setting the genome up for these future conditions in a way that each TE was coded to go off on a particular date to make the exact animals that we have today or was God’s plan only that each animal could make a variety of things but He didn’t plan each one specifically? Do you lean deist or open theism or how do you find a place between the two? I said radiometric years. They may not be equal to normal sun years. Biology, genetics as we know it cannot be millions of years old. It is impossible. No, but the observation that it does not require novel information is covered up. The 500 species of cyclids arose WITHOUT an addition of novel genes!. This evolution does not require novel information, because It is just a matter of reorganization of preexsiting genetic programs. What was kept from us for about 3 decades was McClintock. What was also kept from us is the alternative to gradual Darwinism. Do we read in our textbooks on Schindewolf, on Goldschmidt, Berg, Broom, etc. Their ideas have been selectively removed. They provided the ideas and mechanism. Only when we found out about half of the genome is made up of McClintock “variation inducing genetic elements” (the Darwinians coined it junk DNA) things started to change. We will not undestand biologz as long as Darwinsist are dominating the field of biology. If you think that “junk DNA” was an invention by “Darwinians” I suggest that you read up a little bit on the recent history of molecular biology. Also, the fact that phenotypic diversity can be generated from existing genetic diversity (e.g., domestic dog breeds, which would most likely become separate species after 12,000 years) does not mean that all phenotypic diversity is generated without the addition of novel genetic information. Different breeds of dogs may have similar genotypes: different species of canines have genotypes that are different from each other (i.e., different genes), even if they are phenotypically less variable than domestic dogs. The term junk DNA came from Susumo Ohne. And was propagated by Crick, Orgel and additional Darwians. Do dogs have different genes? Most likely dogs do not have different genes, they have different alleles of genes. There are no studies on differen genes in dogs. The term gene and allele are often mixed up. I can imagine different breeds of dogs have lost indpendently genes and it looks as if they have evolved different genes. Still, going back in time the gene pool is getting wider, not smaller. Loss of genes would be expected from this differentiation process. Not by anybody you’re interacting with here. Note that there are around a dozen different genera of extant canines, and several more time that number of extinct ones. Any examples? Or did you mean alleles instead of genes. Kruglyak and coworkers showed that different dogs types hardly have alleles. It is all a matter of reshuffling and duplicating preexisting genetic information. So, this sort of evolution is frontloaded and does not require novel genes. This is know for at least 50 years, but it has always been ignored. They are talking about domestic dogs (who surely have different alleles, otherwise how do you explain the difference between a bulldog and a pomeranian?) I am talking about different genera with in the family Canidae. I’m also wondering if you actually ever read the posts of people who you reply to here. Yep, and they hardly found alleles. They do not mention novel genes. So it must be something else. Transposable and transposed elements and gene regulation. The TEs put the chromosomes in 3D space and provide the bauplan for the organism. This, togetehr with gene losses, is the only difference. We have reconstructed the phylogenetic relationships of 23 species in the dog family, Canidae, using DNA sequence data from six nuclear loci. Individual gene trees were generated with maximum parsimony (MP) and maximum likelihood (ML) analysis. In general, these individual gene trees were not well resolved, but several identical groupings were supported by more than one locus. Phylogenetic analysis with a data set combining the six nuclear loci using MP, ML, and Bayesian approaches produced a more resolved tree that agreed with previously published mitochondrial trees in finding three well-defined clades, including the red fox-like canids, the South American foxes, and the wolf-like canids. In addition, the nuclear data set provides novel indel support for several previously inferred clades. Differences between trees derived from the nuclear data and those from the mitochondrial data include the grouping of the bush dog and maned wolf into a clade with the South American foxes, the grouping of the side-striped jackal (Canis adustus) and black-backed jackal (Canis mesomelas) and the grouping of the bat-eared fox (Otocyon megalotis) with the raccoon dog (Nycteruetes procyonoides). We also analyzed the combined nuclear + mitochondrial tree. Many nodes that were strongly supported in the nuclear tree or the mitochondrial tree remained strongly supported in the nuclear + mitochondrial tree. Relationships within the clades containing the red fox-like canids and South American canids are well resolved, whereas the relationships among the wolf-like canids remain largely undetermined. The lack of resolution within the wolf-like canids may be due to their recent divergence and insufficient time for the accumulation of phylogenetically informative signal. It is an interestig link, but is only shows alleles of gene regions present in different Canidae. The only interesting thing would be gene difference, which they do not show…. Are you seriously suggesting that the difference between an African hunting dog and a South American bush dog is simply a matter of alleles? They are very different kinds of animals. This paper is not specifically noting different genes, it’s true: it is about establishing a molecular phylogeny, which in turn is determined by genetic differences. Most of the studies focus on mitochondrial DNA because that is more tractable to analyse, but they all show genomic differences between canid genera. If these different Canidae genera were simply a matter of different alleles, then they would be able to interbreed. I think you’re still stuck in thinking about domestic dogs. No, i did not say that. I said that the publication you linked only studied alleles. They did not study the real differences between the genomes. If they would have done that, they would have found the gene pool of the original canines present on the ark. Comparitive genetics is clear about one thing: the further ypou go back in time the more informaation is found. That is exactly the opposite as Darwinian theory would predict. Therefore, the framework you are defending here is not even wrong. It is just false, starting from false premises about biology, genetics and species. Ah, so this is interesting. Your assumption, and it is an assumption, is that if you compare two genomes of organisms that share a common ancestor that if they have some different genes that then the ancestor must have bad all the combined genes. So its all about loss of genes rather than any gains of new genes after or during speciation events. So if we take all the canine genomes we could make a list of all of the genes in the canine ancestral kind. How do you know when to stop? Couldn’t we take all of the carnivores and do the same thing. The original carivore could have had all the genes for cats and dogs and so the differences we see between the two today are just losses of information. I guess the question become just how much information could have been in a created kind. Maybe there was just one crustacean kind with a massive genome that then decayed into all crustaceans alive today? I linked you to my book several times, and I even offered a free electronic copy to poeple who post here (did not hear anything as yet). That goes for you to. In my book I describe indicators, which would discrimante between baranomes, different created kinds. The offer is still standing. Thanks, Peer. I’m adding “This evolution does not require novel information, because It is just a matter of reorganization of preexisting genetic programs” to my catalogue of creationist fallacies. Though I don’t know whether I should bother, since anything I write will not be new information but just a matter of reorganization of preexisting English words. Paul, you start to understand the frontloaded evolution concept. A species is like a book. Or as a letter. Novel species can arise from treshuffling the words of that book (or letter). New kinds cannot be formed from that book (or letter), since it requires the dictionary for additional words (information). Your letter above can be regarded as a species. You can reorganize your word in a dozen ways and come uo with several meaningful species. But you cannot come up with entire novel information without consulting to the dictionary (which is in your head and draining it requires intelligence). The dictionary will give meaning to your new kind (a novel letter), which can be reorganized in a dozen ways to yield new species. This is exactly how biology works. You assert that Lake Victoria was dried up twelve thousand radiometric years ago, Peer. Isn’t twelve thousand years about twice the length of time that the whole UNIVERSE has existed, according to traditional YEC chronology? Do you agree then that that chronology is totally up the spout? How old IS the universe, IYO? And what do you mean by “radiometric years” anyway? Please clarify. Is this your shorthand for “years as calculated by radiocarbon dating and accepted by all mainstream scientific disciplines, which I am at liberty to accept as valid whenever its findings happen to be useful for an argument I wantt to make, while rejecting it as totally invalid the rest of the time”? If so, please confirm, for the sake of consistency, at what date YOU believe Lake Victoria was last dry. I am a molecular biologist. I know a lot about biology. I do not know anything about radioactivity, sedimentology, ages of stones and lakes. I followed the geologist, who claim the lake was dry about 12000 BP. All I know as a biologist is that the biological systems that I study cannot be millions of years old. Thousands, not millions. Good that it is admitted. Because we read the stuff you post here, which is a smattering of allusions to recent molecular genetics, all done by scientists who completely accept evolution, overlaid with your interpretations and assertions based on your belief that the world can be no more than 6000 years old because of a calculation by James Ussher in 1654, and claims of victory that all current science is mistaken. I very much doubt that the book is anything else but such posts writ large, although hopefully with fewer spelling errors. Obviously radiometric half lives were double the speed after and during the flood, just like the speed of light was way faster in the past. 95% of plate tectonic motion accured during and after the flood, therefore rapid evolution after the flood would make total sense. Why cant you smart people figure this out? Why are they not teaching this in schools. I am so looking forward the the Arc in Kentucky taking its first voyage. Sometimes it is difficult to see whether something is serious or The Onion. Kind of like answers in genesis?Those are views held by YEC. Serious or The AIG version of Onion? Let me ask you all a question…the doubling of chromosome 21 and its obvious phenotypic effects took millions of generations, or only one? Chromosome fusions which create novel genetic context takes thousands of generations, or only one? The transposition of a transposable element with all its gene regulatory functions takes hundreds of generations, or only one? The duplication of a gene to adapt to chemotherapy takes hundreds of generations, or only one? The deletion of a gene by a transposon or by a random mutations to give an advantageous phenotzpe takes millions of years, or is it instant? Now for Darwin…the arrival of a novel gene from scratch by takes billions of mutation/selection takes one generation, or millions of generations? Now I ask you: What model is reflecting biology better…the saltational of the gradual? The saltational model has been around for over 100 years, is superior to Darwinian gradualism, but was completely ignored by the antiscience movement of the Darwinians. Isn’t it obvious that we have all been deluded by the gradualists? Isn’t it time we acknowledge this and start doing biology again, instead of philosophy? Darwin knew nothing about genes. But for evolutionary biologists today, the answer would be one. I think I see the source of your confusion, if you imagine that ‘darwinists’ think that a mutation takes millions of generations. Of course, the time that it may take to become fixed in the population is a different matter, although it wouldn’t be ‘millions of generations’. Most of what you write here makes me suspect that you’re quite unfamiliar with modern evolutionary biology. Janis et al. Janis commented about African hunting dogs and the South America Bush dog and their differences. I agree that these are very different dogs and any comparisons to differences among domesticated wold breeds is an apples to oranges comparison. This highlights a gulf, or maybe a contradiction, in YEC literature. Some literature focuses showing amazing adaptation of a particular animals and how this or that feature must be the product of design. Giraffe necks had to be created, sea otters are so specialized that they were designed as they are, etc… Then on the next page we are told that the body plans and genomes of organisms are so flexible that a fox and wold are just the same genome reorganized into a different package. Its is hard to tell if these YEC writers have truly different views of how differences were created or generated or if they simply don’t know enough to realized they are contradicting others. There are very few that try to combine specific design with massive flexibility. Back to the main line of the comments above. These canines are far more different than a few tweaks of their genomes. There are enormous differences. I keep coming back to this same nagging question which no YEC seems to want to answer. If a fox and wolf are just adaptation of one body plan how can any YEC deny that humans and chimps don’t at least look like they are adaptions of the same kind of organism as well. Why can’t YECs just say that the level of biological similarly is equivalent to that found in other “kinds” but they have other criteria (the Bible) that tell them that they are different kinds despite the physical appearance. Instead we get all these supposed differences which if are true would make most of the other things they say are the same kind NOT the same kind. Perhaps because a fox has no fear of looking into a mirror and seeing a wolf looking back . Interbreeding is a criterion. Although atheist Josph Stalin tried to breed chimps-humans he was not succesful. We know now why…because the genetics are verz dissimlar. At least 16% at DNA sequence level and at the informational level we have 2555 miRNA genes not present in chimps. The info gap is so big it cannot be bridged by a natural mechanism. So, all evolutionsts are wrong. How biology really works can be found in my book. Sure is. That’s why Vulpes and Canis are known to be separate genera, no interbreeding. Nobody would expect Pan and Homo to be able to interbreed. But creationists apply the “look similar so they must be the same kind” to all organisms except anthropoid apes. Page and goodman even wanted Pan and Homo to be one clade after they foudn only 0.69% difference (after filtereing and filtereing and filtering of course). Mr Page thought thez are the same species and might interbreed. Stalin did the experiments. Anywaz, the information gap is at the level of regulatory genes, just as I predicted in my book over ten years ago. Still availbale and my offer still stands (free electronic copy). This comment was actually about Canis and Vulpes, taxa that you recently claimed showed only allelic differences. I note that you have avoided dealing with that issue. Pan and Homo most certainly are a clade: that is, they share a common ancestor not shared by any other extant taxon (that clade also includes the extinct genera Ardipithecus, Australopithecus, and Paranthropus, plus perhaps Orrorin and Sahalenthropus). I do not know the identity of the ‘Mr. Page’ to whom you refer, but I have never seen any scientist claim that Homo and Pan are the same species. I’ve seem claims that they should be in included in the same genus, based on the genetic similarities in comparison to the similarities we know between other related genera (such as Canis and Vulpes), but this does not appear to have been adopted by the scientific community. Different species within the same genus do not usually interbreed and produce viable offspring. I know of many prominent geneticists from the mid 20th century, but I do not include Joseph Stalin among them. To return to the genetic differences between Pan and Homo: I’m sure there are many differences, but let me explain how somebody trained in phylogenetics perceives this issue. All extant species are going to have unique genetic differences from each other. How could it possibly be any other way? They will all have been undergoing genetic changes since the time of their divergence. If Pan and Homo separated around 7 Ma (which is how the genetic data have been interpreted) then both will have diverged from the other in all kinds of ways, genetically and morphologically. But those differences are not what determines their status as sister taxa: rather, it is the similarities that they share that neither shares with other apes. Remember that, based on morphology alone, people did not used to think this, and thought that humans had diverged from all other great apes around 17 Ma. The genetic data, presented in the 1970s, came as a huge surprise, and many scientists resisted it. But in the end, the quantity and repeatability of the genetic data resulted in changed views. Different methodologies of assessing genetic distance will yield different results: it’s not the absolute values that matter in determining relationships, but the relative ones. Unless you can show that there is nothing unique shared between Pan and Homo (to the exclusion of Gorilla), the conclusion reached by molecular biologists that these are sister taxa remains. The fact that they can be shown to have differences from each other is irrelevant. Thanks for the standard story, Christine. There is nothing wrong or bad about determining relationships. What is wrong is weaving an evolutionary story around it. Why? Because biology is based on information, the gaps between organism are built by novel and unique information. And it is this information that does the evolution. And it is this information that cannot be formed gradually but only instantly. And therefore we should drop Darwin. Christians should drop Darwin and come with their own evolutionary theory, which is conform what the Bible teaches. Incidentally, my book is just doeing that. Instant evolution and speciation through frontloaded genetic mechanism, which were not recogniyed since they were coined “junk” by Ohno and adopted as such by the darwinians. Who were the creationist researchers who discovered this genetic information (apparently unknown to biologists subscribing to evolution)? No just common knowledge of people of the field, like me. Not everything new has been publsihed, my dear. That’s why it is new. A few years ago there was this contest over at the RNA blog qho would go and predict how many human speciific RNA genes were going to be found in the genetic comparisons. Then, it was 800 something. In the meantime it is 2555. Why has it not been reported by evolutionary science? Because it is not science. There is much science out there that is not yet published, but is known to the people in the field. Eventually, however, if it is any good it will be published. You are implying that this information on human RNA has been discovered by creationists and is being withheld from science by evolutionary biologists. I find that unlikely. And, as I previously noted, the number of specific genes of any type in any extant species is irrelevant. How many specific RNA genes are shared between Pan and Homo but not present in Gorilla? This is not my field, so I expect that if there are none you can provide the reference for that. If you were to read my book, you would know a lot about vertebrate diversity, evolutionary history, and phylogenetic relationships. But I won’t mention that again. Note that Vulpes = the red fox. There are many types of canids that are called foxes. Do you read the links you post, my dear Christine? It is on haplotypes and SNPs, so it is analysing alleles, not genes. The real genetic difference (the genes) can only be found in whole genome alignments. This has only been done for human and chimp and the difference is 16%. The genetic content differs by over 3000 genes, including the 2555 miRNA genes. A random darwinian proces cannot account for this novel information that serves a metaregulatory goal. So the creationists’ conclusion that we do not have a common ancestor is valid. Did you read past the title and abstract of the paper? Yes, this is the difference that the authors note between different breeds of domestic dog, which are indeed only phenotypic. But the authors also note genomic differences between the genera of canids, detailed later in the paper (and as I referenced in my original post). As I understand it, nuclear exons and introns are portions of the genome, not simply alleles. If it’s only been done for human and chimp, then how do you know that something similar isn’t the case for different genera of canids, such as Canis and Vulpes? What is your reference for these numbers? And what percentage of the total genome do they represent? I already explained how unique differences between taxa are irrelevant as long as there are unique similarities that unite them. You did not address that issue. You have yet to explain how and why genetic differences cannot be accounted for by ‘darwinian processes’. You have lots of assertions, but you provide little in the way of evidence. We are talking about information, novel DNA sequences unrelated to existing sequences. So it does not mind and it is irrelevant whether you can unite similarities at the macrolevel. You have to explain novel genetic information. That is what we observe between humans and chimp. The materialistic evolutionary community has to provide us with an explamation for this novel genetic information. They cannot because information is on a higher level than matter. It is immaterial. So it must be ignored. As you can see it is known since 2013 but has been completely ignored by evolutionary “science”. Considering we only have about 20000 proteincoding genes, this is a tremendous amount of novel information. It simply overturns evolutionism. I’m replying to Peer’s comment below this one, which for some reason has no ‘reply’ option on it. I believe that geneticists have explained the origin of novel genetic information in various ways, it is not my field. However, all new taxa have novel genetic information, which is inherited by their descendants. If this was not true it would be impossible to construct molecular phylogenies. I, like all other organisms alive today, have around 100 novel mutations from either of my parents. Does that mean that I am not related to them? This is a tech company supplying assays. They have a few taxa listed as sampled: as well as humans, a few common mammals and a couple of other vertebrates (chicken, zebra fish), plus some common lab invertebrates (fruit fly, nematode), and some common plants (e.g., rice). Now, most of these taxa have around 500 unique miRNAs, somewhat fewer than humans (2632), but not an order of magnitude different. I was wondering how they determined that these miRNAs are “unique” as there appear to be few taxa for comparison. How many of this human miRNAs shared with chimps, for example, or even with other primates? But then I realised that the data here provide a natural experiment: there are counts of miRNAs for rat and mouse, rodents within the subfamily Murinae of the family Muridae, surely critters that belong to the same ‘kind’. However, while Rattus novegicus has a “normal mammalian’ unique miRNA count of 762, Mus musculus has a near-human one of 1963. Surely evidence that mice are a unique created kind, nothing whatsoever to do with rats. Interesting link. The paper shows that the variation in domestic dogs is largely determined by transposon-like elements known as SINEs (short interspersed nucleotide elements), which I described in my 2008 JoC as one of the several different types of variation-inducing genetic elements (VIGEs; see figure 1 of the linked paper). The genome is frontloaded with genetic elements that induce variation, adaptations and specation. It does indeed. It’s also interesting how you continually divert a discussion about genomic diversity within a family (Canidae) to be about the diversity within a subspecies in that family (Canis lupus familiaris). There is no debate about lack of genotypic diversity within the domestic dog. It’s difficult to know whether this is profound confusion or deliberate obfuscation on your part. Peer’s info is very dated as well as incorrect. That is 2013, and it says “It says: “June 2013 UPDATE: miRBase 20 was released June 2013 and lists 2555 unique mature human miRNAs.” Now miRbase 22 is out. There one finds a total of 1917 Homo sapiens entries, the present day validated number. Peer, how do you defend your ‘completely ignored’ once you look at the literature? miRbAse 22 shows 1917 VALIDATED homo sapiens entries. It does not tell us anything whether or not they are found in chimps too. This comparsion was not don, I presume. miRbase 20 showed 2555 human specific miRNAs. Phylogenies can onlz be performed with miRNA genes shared by the organisms. Per definition one can not perform phylogenies with sequences that are only found in humans. So, the reference you refer too are not helpful. The reference to Fromm et al is interesting. Of course evolution of the microRNAome is not evolution, but simply the appearing of novel mivroRNAs genes in the human genetic system. You can call that “evolution”, but is just equivocation for “the appearance of novel information.” In my new book I show that intergenic regions already preform such sequences, i.e. the intergennic regions are not just random sequences, but they already have a potential function and only have to acqurie the regulatory sequrnces (which are often on transposable and transpsosed elements) Yes, my friends, the genomes are frontloaded and that is biological fact. So, Darwin, please leave the stage. In which case, you cannot establish if they are indeed unique (some or all) to humans, or if some are shared with chimps. The source that I got from your previous links shows that all extant species have novel miRNAs. Just as all extant individuals have novel mutations. Mice have nearly as many novel miRNAs as humans, and certainly a lot more than rats. By your mode of argument, that should lead to the conclusion that mice and rats cannot be related. Is that, indeed, your conclusion from the data? All new organisms/species have unique genetic changes, and the fact that those changes are inherited by their descendants (and so accumulate in lineages over time) is what allows us to use genomes to trace phylogenies. (Not that such phylogenies bear good correlation with the phylogenies originally obtained from morphology, with a few differences, such as the sister-group relationship between chimps and humans revealed by the genetic data). That is your interpretation of genomic data. How much of that data was collected by others, and how much of it did you actually generate for yourself, in your own laboratory? Again, the assertion of frontloading without any specific argument or data. Peer, how do you defend your ‘completely ignored’ ( miRNA has been completely ignored by evolutionary “science”. ) once you look at the literature? If you want phylogenies and miRNA, just look in Pubmed. .
You’re correct. Unique characters, whether genomic or morphological, are completely uninformative as to interrelationships, and so are quite rightly ignored by phylogenetics. What is used is synapomorphies, or shared derived characters. That is the type of information that does show indeed relationships: and note that the different methodologies, using quite different types of information, result in broadly similar phylogenetic trees. Of course, the unique characters of species alive today will, should the world continue, eventually become the synapmorphies that they share with their descendants. In which case, you’ll have to stick with the original argument that each species is its own kind. Makes for a bit of an overcrowded Ark, however. I have not read Paul Davies’ book, but I have read a number of interviews with him about his ideas. He does not support the notion of supernatural intervention in the generation of information, nor in the creation of the laws of physics. Thanks for searching out these refs, Peter. The McCreight et al. paper clearly shows that the distribution of miRNAs within primates supports the same phylogeny obtained from other genetic information (including mitochondrial DNA), and also from morphology. Don-t you see the obvious circular bias from Darwinian dogma in the publications linked above by Peter? Information here is defined as the darwinian Eugene Koonin put it, i.e. the sequences have to be evolutionary conserved. In this way we will never find the unique information that sets species apart from each other. The only waz to identify them is to do functional studies, in the lab. Don-t you see that the Darwinian paradigm is a huge science stopper, again? In order to understand biology, we have to get rid of Darwinian paradigm. That is the only way we have to move forward. So, read my book. The new paradigm is in there. Phylogenetic algorithms simply search for synapmorphies. There is nothing circular in this reasoning, and I note with some amusement about how, yet again, you are happy to consign entire areas of modern science to the dustbin, as if nobody but yourself really understood any of it. Here’s the thing: if you’re unaware (as you clearly are) that phylogenetics does not use unique characters to determine relationships, then you have no business criticizing it. It does no good to keep calling yourself a biologist, you clearly lack sufficient knowledge in this area of biology. They are indeed. If they were not, we would be unable to perform phylogenetic analyses on genomic data. There is no circularity in the methods: the methods optimize to the best classification of the OTUs in the data, and that yields a tree that is a clear evolutionary hypothesis about f.i. mammal phylogeny (as in Tarver et al 2016). It seems Peer should look more into what the methods do. Peer shifts the argument again, but his statement that ‘miRNA completely ignored’ ( miRNA has been completely ignored by evolutionary “science”. ) proved not to be supportable, so he dropped it. Orphan genes are species specific, so is each species now a created kind? The ‘kinds is about families’ trope was necessary as the high number of species did not fit in the ark. How do you find indicator genes? I asked this before. Peer, a few weeks ago you said you’d send me a digital copy of your book if I let you know my email address. I appreciated that gesture and gave you my email address, but haven’t seen anything from you in my email. Did you change your mind? Thanks.